Yesterday, I have attended TEDxZurich. TED stands for technology, entertainment, design and is branded “ideas worth spreading”. What is TED and TEDxZurich? There is, of course, the official answer to this question. And then, there’s my personal answer: TEDxZurich is many things at the same time. It is conference, entertainment, education and community, it is a networking event, a recruiting platform, a film set and, accessorily, an advertising opportunity. I’ll explain myself, by starting with the last point. Almost 1 year ago already, TED aligned their advertising strategy with their core values. They created a competition called Ads Worth Spreading, perfectly in spirit with pull marketing: ads should be so good people would actually want to watch them. They succeded. Because it is a great illustration of transmedia storytelling, I would like to share with you The Chase Film, one of the winning ads, screened at the very beginning of TEDxZurich. On spot advertising ranged from very acceptable (same old billboard displays, but discreet) to familiar bikes and highly appreciated roasted chestnuts outside, in the “Indian Summer” sunshine. The location, a tv studio, must have amplified the awareness that we, the attendees, are not the (only) public. We are also extras for the public of countless internet users once the talks are published, timelessly, on TEDxTalks. Yesterday, I heard people complaining about why laptop users were asked to sit in the back rows. Well, although the main character is the speaker, the attendees are sometimes filmed in countershots. Wouldn’t it be a shame if the video showed light radiation from electronic devices, or even people openly distracted by these devices? I can totally understand the request from a quality/branding point of view – let alone out of respect for the speaker. However, the use of laptops etc. must not be considered negative per se. Having been to Liftconference, where the use of laptop & co. during talks is not stigmatized, I have experienced that the use of social networks during the conference has created great leverage in community building among attendees. And TEDxZurich is only one piece of the puzzle. The proclaimed goal is “to stimulate dialogue through TED-like experiences at the local level”, which is certainly reached with talks like Matthias Daum‘s elucidating presentation of Switzerland’s urban sprawl. As a speaker, this certainly is a great chance to impress even beyond “local level” with your speaking qualities and go further – ending up, who knows, at TEDGlobal or the likes. NB: The general niveau of the talks was good – more about that later – but one talk was simply excellent. And I’d be very surprised if I don’t see Molly Crockett on a much bigger stage in the near future. This was my nametag. It was huge. It reads name, name of my company, and three keywords, “tags”, chosen by every attendee individually. In my case, sociology goes without explanation, whereas values and röstigraben might be elaborated in a future article. Big nametags come in handy if you don’t recall somebody’s name, e.g. someone you’ve met… or someone you haven’t seen in a long time. They also help to identify the person we’ve met online, but who had hidden behind an unrecognizable profile picture. Otherwise, it can add to distraction (how not to look at the nametag, even when engaged in conversation? ), awkwardness (is it ok to stare at a nametag repeatedly if I am too shy to say hello?) or even impoliteness (people who don’t bother speaking to others – or especially do so – based on the presumed status of importance derived from a nametag). It’s tricky. But not that important. Much more important, and luckily well respected, is to allow enough time for engagement. In the end, there never is enough time, especially when many people you know already are attending, too. But with a welcoming overall setting, 3 rather long breaks not absorbed by queuing, there were serveral occasions for discussions. Special mention to the catering – irreproachable all along, topped by an outside apero at the very end. And you might know it already: the community extends online. On the TED website, you can create a profile for free and engage with others. These three notions are hard to separate – I won’t even try. It is the key packaging of TED and TEDx: high quality talks. And I listened. And I learnt a lot, yesterday. About algorithms and politics (kind of my personal follow-up after Lift11). About monkeys – in the genealogical as well as in the idiomatic sense. About maps – in the collaborative as well as in the geographical sense. I even learnt about TED – in a therotical as well as in a very practical sense. 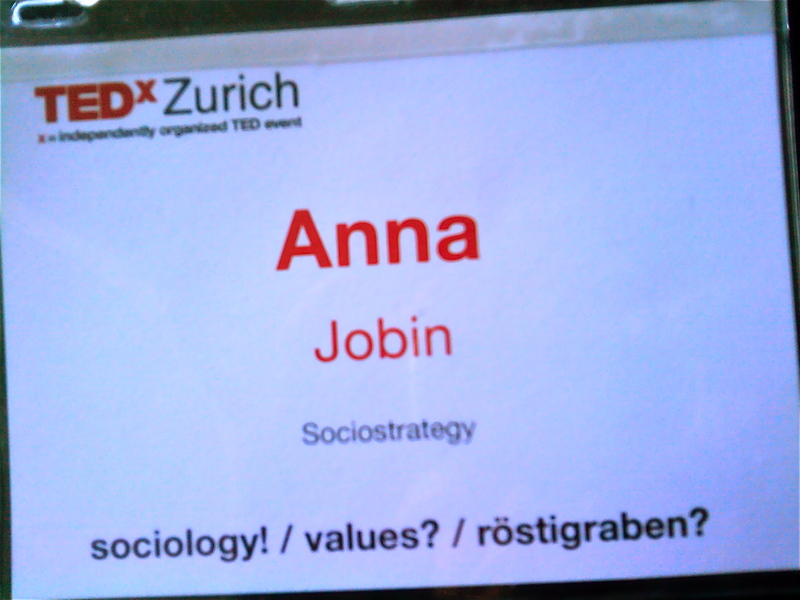 This entry was posted in Event and tagged Conference, TEDx, TEDxZurich on October 5, 2011 by Anna Jobin. I’d be interested in knowing if you have something specific in mind when you say you agree with “most”… The infamous “language” thing?